​and low level laser therapy to achieve optimal health outcomes. Give Lymphatic Drainage a Go! ​Manual lymphatic drainage is a specific type of massage that enhances lymphatic flow. It is gentle and rhythmic; the timing, the pressure and the direction are very specific. It is not like an ordinary massage, no oil or cream is used. It is much gentler than most people expect, as most of the lymphatic fluid sits under the surface of the skin. Lymphatic drainage massage promotes fluid circulation and decongests the lymph nodes. It is therefore useful for treating a wide range of health issues, such as arthritis, breast cancer, fluid retention, oedema, sports injuries, pre and post surgery. It is also helpful in detoxifying the body, helping with general fatigue and tackling a low immune system. We combine manual lymphatic massage with the Bowen technique to give your body a natural boost enhancing your immune system and eliminating toxins. Some cancer treatments can have long lasting effects on your body. Manual lymphatic massage can help with chronic swelling or lymphoedema. 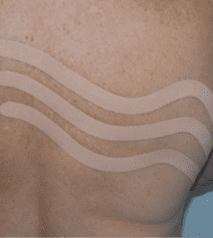 ​of the CureTape for lymphatic indications.